Designers who have worked with Cappellini all seem to have a story about flying into the airport in Milan to meet him with nothing but a duffel bag over their arm and an idea for a chair in their head. 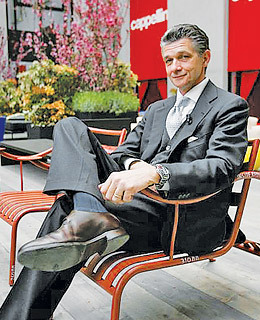 That's because Cappellini is willing to take risks on young and relatively untested talent. Luckily, he has very good instincts. Among the hotshots he has landed for his family's furniture business are Jasper Morrison, Tom Dixon and Marc Newson.